I still haven’t read Greeley, CO’s SF-claim-to-fame’s first solo novel, Lincoln’s Dreams, but based on the quality of her short stories, and this, her second novel, I’m not upset at all that I sprung for a hardback copy of it. Which is a funny way to start a review, but sort of expresses the inexpressable delight that I enjoyed whilst reading Doomsday Book. Frankly, Willis is one of the finest writers I’ve ever read, in or out of the SF genre. However, I feel that her short work stands up better than her novels, and the novels ain’t shabby. 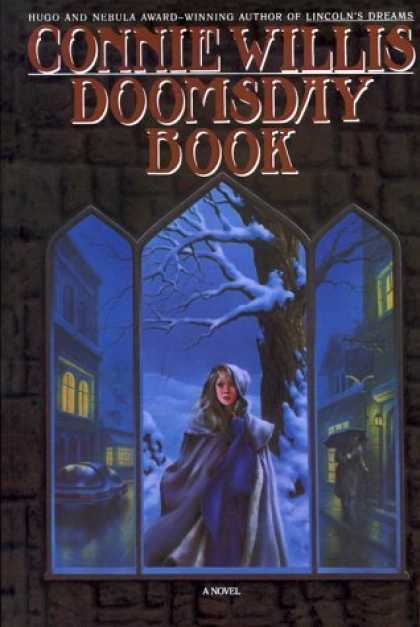 What’s Doomsday Book about? Kivrin, an eager young historian from 2045 gets the chance of a lifetime to “visit” (that is, time travel) to the Middle-Ages and make first-hand observations. However, the transition doesn’t go quite as planned because as soon as Kivrin is sent, the technician in 2045 falls down with a mysterious influenza-like disease. Kivrin’s mentor in 2045 is suddenly caught in a Seriocomedy of Errors as he tries to have her recalled, while also dealing with a quarantine in his own age. Kivrin, meanwhile, is finding out the hard way that everything her mentor said about the Middle-Ages is true. And she’s also finding out that she may not be in exactly the time frame that she originally thought she was. And that’s the basic plot without spoilers. 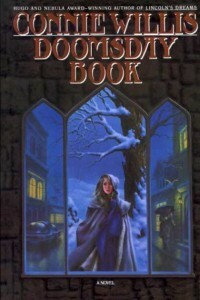 The story is told through two protagonists, Kivrin’s story in the middle-ages, and her mentor’s story in 2045. The point of view is also a very tight third-person subjunctive, which at times can seem repetitive, but is extremely well done.